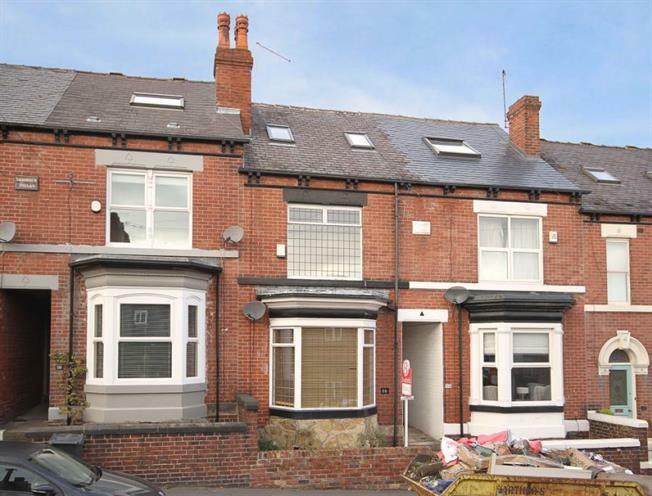 3 Bedroom Terraced House For Sale in Sheffield for Offers in excess of £260,000. A Fantastic, Three Double Bedroomed, Bay Fronted, Mid Terraced Home, Two Storey Off Shot Extension To Rear, Offering Deceptively Spacious Accommodation And Situated In The Heart Of One Of Sheffield's Most Sought After Areas, Within Walking Distance Of The Ever Fashionable Ecclesall Road, As Well As The Beautiful Endcliffe Park. Available having NO ONWARD CHAIN INVOLVED, along with benefitting from gas central heating and partial uPVC/wood double glazing. A Much favoured location, ideal for Banner Cross & Hunters Bar shops & pleasant walks. Catchment area for excellent schools. The property must be viewed at the earliest opportunity & would be the ideal purchase for the first buyer/young professionals or families alike!. The accommodation in brief comprises: Side entrance lobby with stairs rising to first floor landing, Bay fronted lounge with attractive fire surround, rear facing dining room overlooking the rear garden, with access dining room to the Off shot Kitchen with a selection of wall & base units with integrated appliances to include electric hob, oven, extractor fan, dishwasher, automatic washing machine and fridge/freezer. Also having tiling to the splash backs and floor along with a side entrance door from the kitchen leading out into the rear garden area. First floor landing: Master bedroom with front facing window & built in wardrobes, rear facing bedroom double two, large family bathroom/W.C. with white suite comprising: wash hand basin, low flush wc, bath, separate shower cubicle having mains shower within and tiling to splash backs ( bathroom also houses the boiler). A stair case rises from the first to the second floor where there is a fantastic Double attic bedroom three having both front & rear facing velux windows, providing great potential to either split into two bedrooms or add an en suite shower room (subject to necessary consents). Outside: To the rear of the property in and enclosed rear garden with flagged sitting area, with raised lawn and stocked area, accessed via the side passageway. Peveril Road lies off Endcliffe Park, within a short distance of Ecclesall Road with ample shops, cafes, restaurants and bars.